This week, general life has been filled with interesting situations with opportunities to make well thought out, deliberate choices and my craft life has been no different. Now that I have two spindles of similar weight — an Ashford and a Bosworth — I figured it was time for me to spin two braids so I could do a two ply mix. But of course, since I have multiple options, I’m kinda stuck deciding which of the combinations I want to mix into my final yarn skein. The top braid is an October House beauty — Falkland Combed Top, in colourway Lupine — I got for my birthday and the other two are Knitpicks Highland wool roving in Amethyst Heather (purple) and Wild Rose Heather (pink) I bought at last year’s Cyber Monday sale blowout. Both are long staple length so I’m not worried about which way I’ll spin them, I’m going on right now about colour combination. 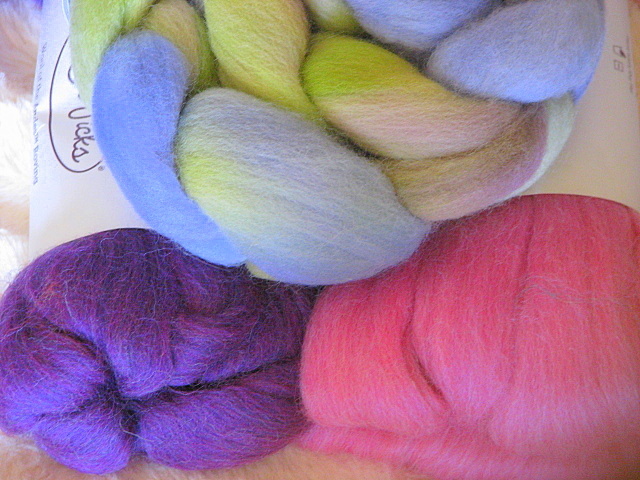 I’m thinking that the Amethyst Heather with Lupine would be a lovely contrast complementing the dark shades of purple in Lupine and highlighting the Lilac shades OR Rose Heather as a more muted option just blending into the mix and keeping the final plied yarn more spring like and light. And while you’re at it, would you consider making another choice? I was contacted by designer, Maria Yarley aka ElegantEconomy on Ravelry, to help support a fellow knitter who’s been having a really tough time. Maria created the pattern — Graceful Pullover — as a fundraiser for our fellow knitter. The goal is 1000 sales by the end of November but if you aren’t in a position to purchase now, would you consider doing it in the future or at least adding it your queue, favourites or maybe sharing it with a friend who might have a sweetie this pullover would be perfect for? However you decide to help, the choice is yours and very much appreciated! Well, I’m glad! Just remember the old adage: “photographs, or it did not occur”..
LOLOLOL! It’s funny you say that, I striped the sample pieces from the braids earlier and they’re now hanging out on the couch. Hoping to spin like the wind tomorrow. Yay!!!!! I’ll be waiting, then. I’m interested to see how they’ll play together, too. Voted and added the pattern 🙂 You had a birthday??? Happy Belated Birthday my sweet friend!!!! The Graceful pullover is a nice pattern for a good cause isn’t it? I have it already in my library and hope to cast on soon. I am thinking I will make an orange one for my orange loving wee girl. Ordering the pattern now. Thank you for sharing about it . Linda.